Please join us this Saturday for SFBATCO's Hapa Voices performance! This event is free of charge. Please join us to review the refined design concept and give feedback! Tickets to the event are $30 in advance, (two or more are $25 each), or $40 at the door for adults. Youth 5 to 17 years are $10; and children 4 years and under are free. Proceeds from this fundraiser will benefit the programs and operations of NLF. 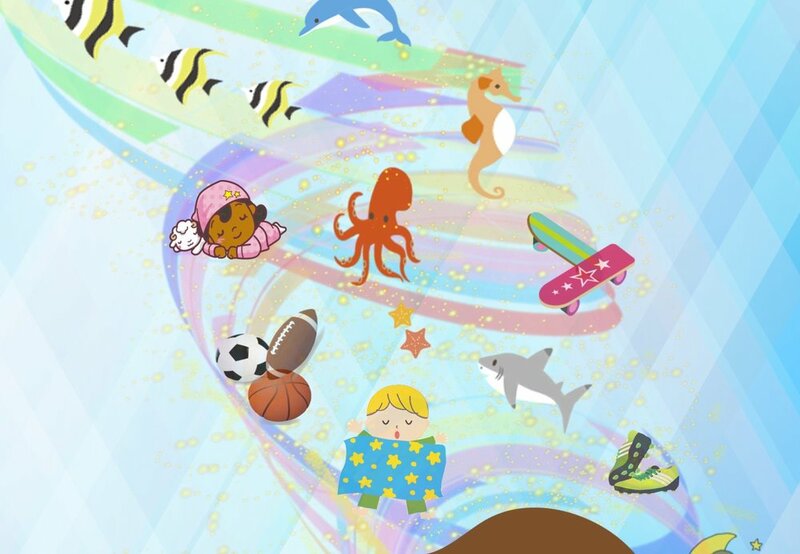 For more information on the event, contact NLF at (415) 922-8898 or email nlfchildcare@gmail.com. More information about NLF can be found at www.nlfchildcare.org. For anyone who missed the presentation on the new hospital on Jan. 8th, and for those who want to learn more, please take the opportunity to walk through the new facility on Feb. 2nd. Please see the notice for the Open House. invite you and your community to provide input into our strategic planning processes. Thursday, January 31, 2019 - 5:30pm to 7:30 p.m.
· The Consolidated Plan is the primary MOHCD plan that identifies affordable housing and community development needs and priorities. · The Analysis of Impediments to Fair Housing looks at fair housing issues and how they can be addressed. · The HIV Housing Plan focuses on housing-related programs for people living with HIV. · The Community Stabilization Strategy provides the comprehensive analysis and tools City agencies, decision-makers and the public need to make strategic decisions to stabilize our vulnerable populations as the City changes. · The Housing Affordability Strategy provides a framework to evaluate how our housing policies and plans work together to address housing affordability for our diverse population. This is an opportunity for all San Franciscans, and especially residents of Districts 5, to share their opinions and experiences related to housing and social service needs,barriers to fair housing, and improving housing affordability. We would greatly appreciate your assistance with distributing these flyers to your network, including members, staff, clients or customers. In your communications, please highlight that we will provide food, child watch and Spanish and Cantoneseinterpretation at the event. Thank you in advance for your help with getting the word out about this event. We look forward to seeing you there – and to hearing how you would address the housing and social service needs in your community! Please come join us for a meeting with SFPD Northern Station’s captain and officers! 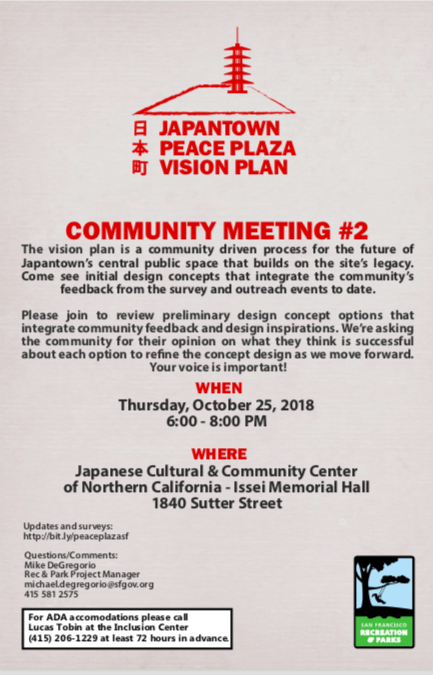 Please fill out the Prop E poll to advocate funding for Japantown by Jan. 22nd! Please copy and paste the link into your address bar. Thank you! Cathedral Hills Neighborhood Association and Japantown Task Force, invites you to attend the CPMC/Sutter Health meeting on January 8, 2019 held at The Sequoias Auditorium, 1400 Geary Blvd. Please send your RSVP to marlayne16@gmail.com. We hope to see you there! Welcome the New Year of the Boar and celebrate with cultural arts & crafts, food and entertainment! Please take a brief moment to take this SURVEY and weigh in on multiple proposed sites for locating Ford GoBike racks. SFMTA intends to install three racks in the Japantown area. The racks are a modular system of 15 – 23 bikes that will take up/displace 3 to 4 on street parking spaces. SFMTA prefers to locate racks near transit and in front of businesses. They are not placed in front of public utilities. SFMTA will be using the survey data to determine where to install the bike racks. 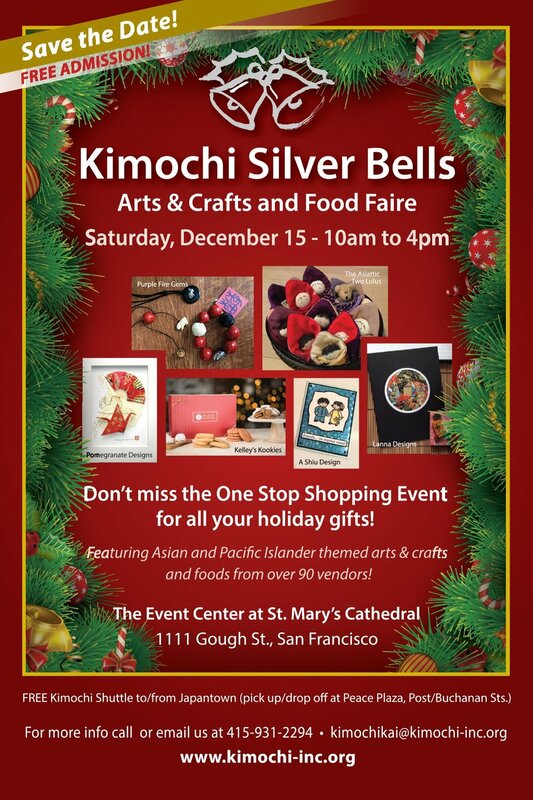 Please come shop and dine at the Kimochi Silver Bells Arts & Crafts and Food Faire!! Santa Claus has arrived to the Japan Center Malls! Bring the little ones and come take your picture with Santa! Please join us at the Aki Matsuri and celebrate 50 years of the Japan Center Malls! Save the date! Japantown Chounaikai is hosting the 3rd Annual Osaka Matsuri. Experience Osaka's culture through dance, music, and food! Celebrating the 45th Annual Nihonmachi Street Fair! Experience Asian-Pacific American performances, traditions, art, music, food, and community outreach and service. Bring the whole family, and enjoy a day of activities in Japantown! And, register to help paint on JULY 28! Come celebrate and have a fun day with the BCSF! Enjoy a summer celebration of love for anime and cosplay in San Francisco's Japantown! 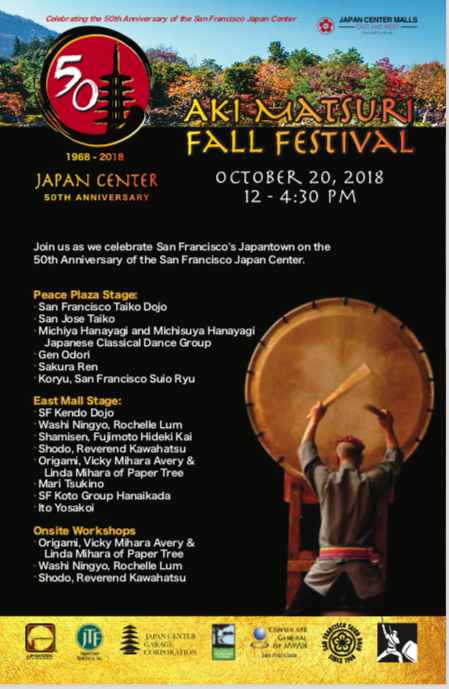 Celebrate the Japanese Cultural Heritage of Japantown with free performances including taiko, dancing, singing and workshops! A fusion of friends, artists, and musicians from the Japanese and international communities. Join in the celebration that will take place in the Peace Plaza between the East and West Malls. Discover the art of traditional Kaiseki cuisine with Kimika Soko Takechi and Larry Sokyo Tiscornia. Make a real, playable bamboo transverse flute! Great for both kids and adults. Learn about flutes from around the world! Chapter fundraising event proceeds to benefit Jon Osaki's "Alternative Facts: The Lies of EO 9066" $40 per person, children 7-10 years $15. Tickets available at Paper Tree 1743 Buchanan Street.